Over the last twenty years, I’ve seen aromatherapy grow from an almost unknown alternative modality employed by a few well-informed practitioners into a multi-billion dollar a year industry in which fortunes have been made by a few companies employing sophisticated marketing strategies aimed at the general public. These companies have been very effective at getting their fingers in many people’s wallets while destroying true aromatherapy in the process. The sale of essential oils to the public is now dominated by a few aggressive companies armed with huge marketing budgets and bottomless greed. Make no mistake about it – if you are a user of essential oils, you are a “mark” in the eyes of these kinds of companies, and in my opinion, there’s not much some of them won’t say or do to get your money, even if that means putting you and your family at risk. With widespread commercial marketing, the public face of aromatherapy is changing. For decades, skillful aromatherapists have used a carefully selected range of essential oils to safely and effectively promote healing, but now untrained consumers are being encouraged to take higher and unnecessary risks in their choice of oils and their methods and frequency of use because this strategy leads to higher sales and higher profits. The most effective strategy for selling essential oils is to encourage over-use, push all forms of use (whether safe or not), and make “cure” claims that are unsubstantiated. These marketing strategies have succeeded because the majority of consumers do not have much, if any, knowledge about the real science behind how and why essential oils work. As someone who does understand the physiological and pharmacological basis of essential oils’ actions on the body, I know exactly how people’s trusting natures are being exploited by inaccurate and even dangerous advice about what essential oils can do and how to use them. When properly used, essential oils offer many important benefits with a very low risk of adverse reactions. The key concept here is “properly used”, and it’s definitely time to start being choosy about who you listen to and what you’re willing to believe about essential oils! There are still many ethical, service-oriented essential oil companies out there run by people who are knowledgeable about aromatherapy and who do not promote risky practices or make deceptive claims. You can get the maximum benefit of aromatherapy and avoid adverse reactions by choosing your essential oil supplier carefully, being aware of the hype, and heeding the simple guidelines that I’ll lay out below. The promised benefits of ingesting essential oils are mostly hype. Rather than just ask you to take my word on this, I want to explain why it’s true and arm you with the knowledge you need to make good decisions about essential oil use. The idea that oral use of essential oils is “better” is loosely based on the fact that you can generally get more essential oil constituents into your blood stream by swallowing them, and, in fact, up to about 96% of some essential oil constituents are absorbed into the blood when ingested. But this is only true for SOME essential oil constituents. What you haven’t been told is that some essential oil constituents are actually destroyed when they contact the fluids in the stomach. Lavender essential oil is a good example: among the most therapeutically important constituents in Lavender essential oil are the so-called esters, and esters are virtually destroyed in the stomach. If you’re adding Lavender essential oil to your drinking water you might as well be flushing it down the drain! In addition, some essential oil constituents may be reduced or destroyed by what’s called the first-pass liver metabolism when you ingest them, and we don’t really have enough research to know how big an issue that may be in most cases. Something else that the big corporate companies don’t want you to know is that essential oils are actually absorbed into the blood stream very effectively when simply inhaled. Studies have shown that between 60% and 70% of most constituents of inhaled essential oil are absorbed into the blood stream. That’s not as much as 96%, but it’s still VERY good and carries far fewer risks. And, with inhalation, you never have any problems with constituents of an essential oil being destroyed or reduced in the stomach or during the first-pass through the liver, as you may with ingestion. 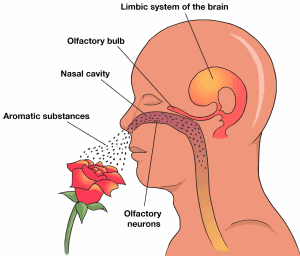 Here’s something else you probably haven’t been told: many of the beneficial effects of essential oils occur due to the fact that when they are inhaled they stimulate the Olfactory Nerve that goes from the nose directly into the brain. This provides a unique pathway through which essential oils are able to directly affect the central nervous system and the immune and endocrine systems without being absorbed into the blood. When you add your oils to your drinking water or, especially, take them in capsules, you lose these benefits. It’s called AROMAtherapy for a reason – and the reason is that many of the beneficial effects that essential oils can exert probably come through the stimulation of the Olfactory Nerve that happens ONLY when they are inhaled. The craze for oral use that’s been created through marketing is, in my opinion, nothing more than a scam that takes advantage of people’s lack of in-depth knowledge. Do not ingest essential oils. Be aware that ingestion of essential oils increases the risk of adverse reactions and can be dangerous if you are not WELL trained in this method. Ingesting essential oils carries a risk for irritation, or even tissue damage, to the lining of the Gastrointestinal Tract, and this is true for any amount of essential oil ingested, even just a drop or two. In addition, some people have reported nausea and/or vomiting following ingestion of essential oils. Increased risks for organ toxicity, fetotoxicity (toxicity to a developing child in the womb) and for drug interactions are also often cited as issues with oral consumption of higher “doses” of essential oils. Ingesting a few drops of essential oil in a day is not going to give you a substantially greater benefit in most situations than you get with external use – and may, as detailed above, give you even less benefit in some situations. WHY DO IT? Look for “external use only” on labels when selecting essential oils. Responsible essential oil companies put a warning against internal use on their labels. This is NOT because the essential oils they are selling are in any way of lesser quality than those sold by companies pushing internal use. It is because responsible companies know that an untrained consumer incurs unnecessary risks by ingesting essential oils. Again, why do it? Always dilute essential oils before applying them to the body. Some companies push topical use of undiluted essential oils. The potentially harmful results of this procedure, which can produce severe burns in some cases, are well known to professional aromatherapists. While severe burns are only likely to occur with very irritating essential oils, even some that are less irritating can produce skin sensitization reactions in some people with repeated use. Just because you’ve been using undiluted essential oils for a long time without developing sensitization reactions doesn’t mean you won’t. These reactions, which are a type of allergic response, can be very uncomfortable, and once you become sensitized to some constituent in one essential oil, you are more likely to develop other sensitivities. If you want to be able to continue using essential oils for years to come, never apply them to you skin without diluting them. In most situations, the recommended dilution ratio is a maximum of 2.5% essential oil in 97.5% vegetable oil, but some specific essential oils must be diluted even more for safe use. Know any safety precautions that apply to any essential oil that you intend to use. Buy a good reference book and use it. One very important safety issue is use of essential oils with young children; they react differently to essential oils than do adults, and before using any essential oil on a child, make sure that you have consulted a good reference that includes safe procedures for children. Do not use any essential oil on a child under one year of age without consulting a professional aromatherapist. Use essential oils in moderation. You will get the best results from essential oils by using them in moderation. Do not use nebulizing diffusers to put large volumes of essential oils into indoor air, and do not diffuse continuously. Anytime you begin inhaling essential oil, you will rather quickly start losing your ability to smell it, and this is one reason that people tend to diffuse too much essential oil. Essential oils diffused in excessive amounts can cause respiratory tract irritation and/or chronic toxicity. People exposed to high levels of topically applied essential oils on a regular basis have some risk for developing skin irritation, sensitization and chronic toxicity. With a little awareness and common sense, essential oils are extremely safe for external use and can make a significant contribution to a holistic wellness regimen. As a consumer of essential oils, you can make a significant contribution to preserving the practice of true aromatherapy by being wise and aware. Thank you for your reliable information. I use oils during Thai bodywork sessions. Is there a non-oily base I can use for dilution? I suppose a cream base would be best. Our lotion is non-oily and absorbs quickly – perhaps it would work well for you: https://artisanaromatics.com/product-category/essential-oil-lotion/. We offer it plain (no essential oils) or with lavender oils. We also have Monoi de Tahiti cream which might work for you (very floral aroma). I was surprised that you suggest only 3 drops in a diffuser. I am currently using 15-20 in a nebulizer diffuser on a nightly basis. The unit runs 10 minutes on and then 10 minutes off and then shuts off after 4 hours. I was planning to bring the same unit to work to continue diffusing during the day. Is this considered ok? Hi Sharon, Thanks for your question. I’m not a fan of nebulizing diffusers for home or office because they generally put far more essential oil into the air than is useful. While your levels of use at home would not be likely to be hazardous to an adult for many essential oils in common use, it is likely to be far more than you need for most purposes. A fan diffuser with 3 drops of essential oil is a better choice, especially in a bedroom or other home space.. Gross over-use of essential oils has been encouraged by some companies in order to increase sales but most complaints of negative effects from essential oil use come from over-use. Also, the actions of an essential oil can change when different amounts are used. An example is Lavender (Lavandula angustifolia); while most people consider 3 or 4 drops of Lavender to have a relaxing effect, when larger amounts are used many people will find that it looses it’s relaxing effect or even becomes stimulating. In addition, essential oils can combine with negative ions in the air to form formaldehyde and this can cause respiratory and other problem when the air is saturated with essential oil vapor. Many office machines produce negative ions and a great many of the reports of unpleasant experiences from essential oils have come from people whose office mates were diffusing essential oils at work. Not everyone likes the aroma of essential oils and if you share an office with others, a personal inhaler might be a better choice. With essential oils, a small amount goes a long way and in many cases, you’re wasting your money with excessive diffusion. Ask your office mates before diffusing and if EVERONE is on-board, go with a fan diffuser loaded with just a few drops. Remember, you’ll stop smelling it after a few minutes because that’s just how our sense of smell works -even though you won’t smell it, it will still be in the air. I hope this helps. Excellent read on the avoidance of using essential oils internally. I schooled with (ACHS) American College of Healthcare Sciences out of Portland, Oregon, (on line). I achieved my AAS degree in (CAM), and am also a Certified Aromatherapist. I cannot tell you how many times we were taught to never ingest essential oils while doing our own case studies, and to always use carrier oils before applying oils to the skin. I am currently working on my web site to launch products for my on line store in the near future and I do plan on having an FAQ page for the do’s and don’ts for the safety of the general public and of course liability reasons as well. Thank you for sharing this in depth and extremely important info. Thank you so much, Cathy – and thank you also for your commitment to safe use of essential oils. Good luck with you new venture! Thanks Lori: I’m glad you enjoyed the article. Although it is not an exhaustive reference on safety, The Illustrated Encyclopedia of Essential Oils by Julia Lawless is nonetheless a pretty good place to start; it’s easy to read and is still used as a text in some aromatherapy courses. Yes, I like it very much for entry level. A bit more advanced is Shirley and Lin Price’s book, Aromatherapy for Healtcare Professionals. And, if you really want to dig into EO safety, Tisserand’s Essential Oils Safety is quite good. Great article!! Thank you! I buy all of my essential oils from a company in my town called Nature’s Inventory – they ALWAYS stress NOT to ingest EO’s, and to use a carrier oil – I use their Grapeseed Oil. I also use a diffuser, but not to excess, like you advise. We are very fortunate to have them in our small, rural community. I cannot say enough good things about Nature’s Inventory! I love ’em! Thanks Dee Ann. I’m glad you have found a company you like – if you’re ever looking for something they don’t carry, I hope you’ll give us a try..
Hello from Ireland, really good to read this article, there is a lot of aggressive marketing of essential oils from a few companies happening here as well. In Ireland we have pretty much the same approach as the UK as regards aromatherapy, ie. essential oils are licensed for external use only and must be labelled accordingly. It will be good to have your website as a reference for ethical and professional use of essential oils in the United States. I’m just curious how you came to your conclusions of advising people not to ingest oils? I’m a long time user of essential oils and have been to many, many seminars, classes, and conventions taught by doctors and researches that have explained why it is safe to ingest them. (Granted not just any oil, but only true therapeutic grade essential oils that do not contain any fillers, synthetics, or other unknown chemicals). I’ve had it explained to me how are enzymes are built for processing these pure oils, and have never heard they cause GP damage, UNLESS, they contain something other than the essential oil itself, or are not a properly distilled oil. I also have a back ground in biology so I have asked many, many questions on how our body handles them! I’ve never had any symptoms of ingesting oils, other than a detox reaction, which is what I was expecting. Also I’ve never heard all oils need to be diluted on skin… that’s interesting. I know in my years of using them, there are plenty oils that are safe to be applied neat, unless you have very sensitive skin or are working with children. I do understand some may cause sunlight sensitivity after being applied, and there’s “hot” oils that need to be diluted upon application. The only time I’ve experienced an irritation from an oil I generally perceive as safe without dilution… was because I used one that I later found out was not a pure oil, distilled for the proper amount of time to have any constituents in it. Could you explain more about why you say that/where your research came from? I’m always looking for oily things to look into and read! Thanks for the question Maddison. First, let me be clear that I have not said that essential oils are NEVER safe to ingest; my contention, which is backed up by research and generally agreed upon among professional aromatherapists, is that the risk of adverse reactions is substantially higher with ingestion and to do so safely requires advanced training. My opinions in the regard are based on available research, published in peer-reviewed scientific and medical journals, my own clinical experience, and my experiences as a qualified expert witness in the area of neurotoxicology. Unfortunately, many people are disseminating misleading information and you must carefully consider the motivations and credentials of people claiming to be “experts”. We are now seeing a flood of so-called “doctors” who have gotten basically bogus Ph.D.’s or N.D.’s from correspondence schools known as “diploma mills”. I would be very interested if you could send me a citation for research published in a respected medical journal showing that “our enzymes are built for processing pure oils” and this makes them safe. That sounds like company hype to me. What I think is that the fact that various constituents of pure essential oils ARE metabolized by a variety of liver enzymes is one of the things that increases their risk of doing harm when ingested, either through hepatotoxicity or drug interactions. And yes, some people are able to use undiluted eo’s without developing problems but not everyone is going to be that lucky because undiluted use raises the risk of developing skin sensitization, a type of allergic reaction. This can be a very serious problem. YOU, individually, may never develop sensitization reactions but, on the other hand, you may develop such a reaction the next time you apply an eo – the point is that your risk increases the more you use undiluted essential oils, especially certain ones. If you want to see a good summary of peer-reviewed research on these issues (this is the research that well-trained aromatherapists are familiar with and base their practices on) let me recommend the book “Essential Oil Safety: Second Edition” by Robert Tisserand and Rodney Young (not related to Gary Young). I urge all my students to consult the essential oil profiles given here for determining the safety of any oil under various circumstances. I also suggest you look at the Injury Reports compiled with the assistance of former NAHA Safety Committee Chairperson, Sylla Sheppard-Hanger. In these reports, people describe adverse reactions that they have had following essential oil use and, as you will see, the great majority of adverse reactions have come from oral or undiluted use. Follow this link and click on one of the reports listed at the bottom, then choose the “actual raw data option”. http://aromatherapyunited.org/injury-reports/ . Good luck with your reading. Thank you for this information.. alot of clients ingest and I get on my soap box and tell them to seek a Naturopath or Certified Aromatherapist and not to listen to sales reps from various companies telling them to ingest, one instance a client had blood work and her M.D. was alarmed about her high level of liver enzymes.. I asked her if she had been ingesting oils and she was startled and said she had been,I suggested her to stop.. tell her md and see if the levels went down.. she swore she would never ingest again we lost touch when she moved out of state..this is just 1 of many ingesting reveals. .most mentioned liver enzymes being increased.. Thanks Dena – you might be interested in reading my response to Maddison’s inquiry (above). Thanks for writing this article. I staterd using a big name so brand about 6 months ago. They are very expensive and promote internal use. I did a lot of reading and found that everything in your article is correct. I have since found a new source that has ” not for internal use” on its lable. They are not as expensive either. I have taken a sleep pill for fifteen years but, thanks to oils I have been free of that pill for almost 5 months. That’s just topical or inhalation use. Now if I could just be free of the rest of my meds for fibro…. Hi there! I have recently started taking two drops of lavender, peppermint and lemon every morning instead of taking an over the counter allergy pill. My seasonal allergies are bad in the morning and I feel the same relief/benefits after taking these oils in water then I did when I took the pill. Now reading that I shouldn’t be ingesting essential oils are making me nervous? So is it healthier for my body to take a pill or essential oils? Hi Monica – Unfortunately, it is a violation of medical practice laws for me to give medical advice to people who write in to the blog. I recognize that your question is an important one and I hope that you will follow up on it by consulting with a properly trained health care professional – such as an M.D. who specializes in what is now being called “Integrative Medicine” (these physicians “integrate” alternative and mainstream approaches). Thank you for the helpful information. I’ve recently started using an organic line of EO’s and I’m definitely looking into classes so I can make sure I’m using them properly. I’m about to start a pretty serious regimen of trying to expell a virus internally. There are cleanses and supplements, but I’ve also heard capsulating oregano oil and tea tree can be helpful too. I want the virus out of me, but I want to do it properly. Any recommendations? Cara: Thanks for your comment; I’m so glad you found the information helpful and that you want to be sure that you’re doing the right thing. While I can’t give recommendations for using essential oils for specific health problems, I do want to caution you against using any essential oils internally, for any reason, without guidance from a properly trained health care professional, such as a physician, who has also had thorough education in the internal use of essential oils. Essential oils pose substantially greater risks when used internally than when used externally and the only way to do this right is under the proper guidance. Best of luck to you. Thank you for the response. So with your antiviral blend, when you recommend inhalation, is that effective at killing viruses inside the body? When I am writing for a company that sells essential oils I strictly avoid making claims that any specific product of that company exerts any action on the body and/or can be used for the treatment, mitigation, or cure of any illness. One reason for that is that even when my articles are posted on a company’s blog, my personal goal is to educate, not sell. I’m grateful that Artisan Aromatics supports that intent. Sorry I can’t be of help in that regard. Any companies that you feel are best to be avoided? Any recommendations on reference books? Thank you! Hi Cindy – Thanks for your interest. There are now MANY companies that should be avoided, some because they make false claims and give bad recommendations and others because they sell very poor quality products that are adulterated or not even essential oils. I recommend avoiding companies that are selling very cheap products on mass marketing platforms and don’t have a website. Labels are one way to get a start on evaluating a company. If you look at the labels on Artisan essential oils, you will see that they show the common name of the oil, the Latin name, the part of the plant from which the oil was distilled, the country of origin, the batch number and bottling or expiration date, safety warnings (not for internal use and keep away from children) and more. Companies that provide true therapeutic quality essential oil will always have full information of this type on their labels. Look for companies that are owned and run by people who have expertise in aromatherapy; personally, I wouldn’t even consider buying essential oils from a company that didn’t give the names, contact information and background information of the owner(s). For example, you can always call Ivan or me at Artisan (as indicated on the website) and we feel that you should always be able to speak directly with anyone that you buy essential oils from. The most comprehensive reference on essential oil safety is the book “Essential Oil Safety: 2nd Edition” by Tisserand and Young. It’s one drawback is that it is pretty technical. A good general book on aromatherapy that is less technical is “Aromatherapy for Healthcare Professionals” by Shirley Price and Len Price. Thanks again. I hope this helps . What are some symptoms of chronic toxicity in children? Hi Briana: Thank you for the question. Essential oils used properly are VERY unlikely to produce toxicity issues of any kind but ANY THING, even water, can cause problems if grossly misused and with some companies encouraging gross misuse and over-use of these products we may start to see more problems of this type. toxicity in children may present with some of the same symptoms we see in adults: jaundice, hypertension, reduced bile flow, etc. ; a decline in cognitive function can be a symptom of liver toxicity as well. Chronic systemic toxicity, on the other hand might begin to show up as fatigue, malaise (“I don’t feel good”), headache, dark circles under the eyes and, especially in children, you might see behavioral changes like irritability, restlessness and distractibility. You can search on-line and find other symptoms but if you even suspect that your child may have toxicity issues of any kind, don’t take chances – get them to a pediatrician immediately. If toxicity is suspected, should all oil use just be stopped? Yes, the safest course of action if toxicity is suspected is to stop all essential oil use until a physician is consulted. Thank you Dr Power – your article is music to my ears! I don’t mind helping out my fellow man BUT, when it is to the detriment of our wonderful aromatherapy industry and to make others who have no idea wealthy – I draw a line in the sand!!! Please be well informed about the therapeutic uses and chemistry of essential oils before you embark on the essential oil business – I bet if you are….you won’t!!! Thank you so much for your support; essential oils can be great tools to promote healing and are very safe when used properly. Unfortunately, as aromatherapy has come into the public’s awareness, a lot of misinformation that promotes ineffective and unsafe uses of essential oils has been foisted on consumers who are not trained in proper use and safety and its time that those of us who know better start speaking up.